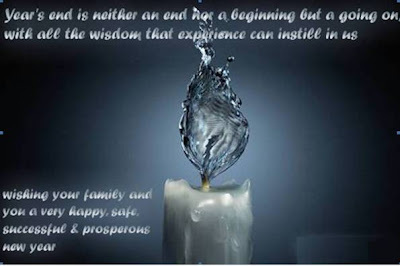 Wish you and your family a very Happy and Prosperous New Year 2010. 2. Keep only cheerful friends. The grouches pull you down..
9. Don't take guilt trips. Take a trip to the mall, even to the next country; to a foreign country but NOT to where the guilt is. 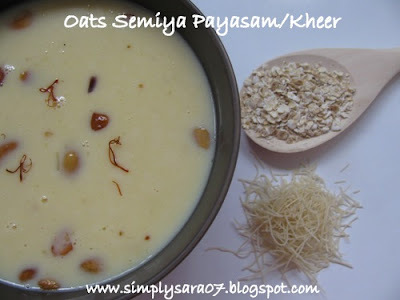 Oats Semiya/Vermicilli Payasam is a sweet dish prepared with milk, semiya, sugar, oats and kesari/saffron. This is my new innovative recipe. Saffron is very expensive ingredient which is taken by pregnant women in milk and also used to prepare sweets. This recipe is going off to Oats Feast here in Sara's Corner and JFI Saffron hosted at Chef in you. In a kadai, add 1 tspn ghee and dry roast the semiya till brown. In a thick bottom vessel, boil milk in low flame as it will overflow. When its started boiling add roasted semiya/vermicilli, sugar, condensed milk and mix well. 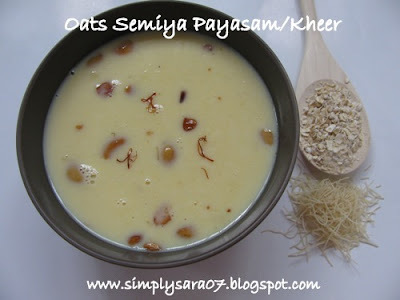 Once semiya is well cooked add oats and kesari/saffron. Boil well till the milk thickens and reduces. Garnish with cashews n raisins roasted in ghee. Serving suggestion - Hot or cold. Hope you had a great Chirstmas and holidays. This is the first time I am doing a Product Review. I would like to thank Gits for giving me an opportunity for review and comment on some of there food products which are Heat n Eat /Instant Mixes. In this regard, I will reviewing/commenting some of their products in the next few postings in Sara's Corner. I always wanted to try Ready to eat. Just got a chance on a tiring day out. We were just looking for sidedish which is simple, fast to cook yet tasty. 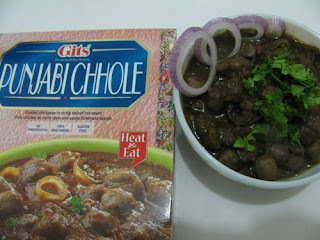 I have tried Gits Punjabi Chole Heat and Eat which is very handy. This pack serves two. 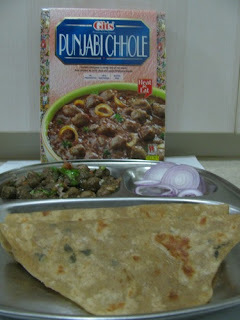 I had prepared dough to make Methi chapathis previous night. I garnished with Onion Rings and chopped coriander leaves. Recipe for Methi Chapathi will be posted soon. 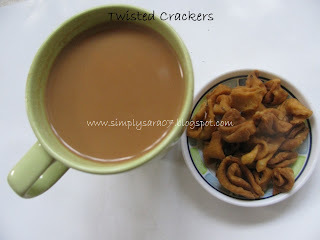 Twisted Crackers simple and tasty coffee/tea time snack. Mix all the ingredients to a dough (like chapathi dough). Make medium sized balls and spread it. Cut them to a medium diamond shape pieces using knife. Then slowly remove each one and twist the corners to get this shape. Deep fry them till brown. 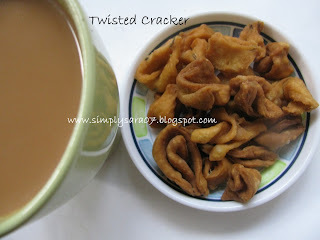 Twisted Crackers/Snack is ready to serve. This recipe is going off to Tea Time snack by EC. Priya of priya's recipe has passed me this award for her 150th post. Thank you so much. Aruna of Veggie Paradise has passed me this award. Thank you so much. 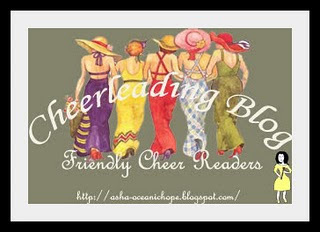 I would like to share Friendly Cheer Readers award to all my blogger friends, visitors and readers of my blog. Please accept it and post in your blog. Chiku/Sapota is very healthy fruit. It is rich in iron helps improve HB. I made the milkshake for the weekend. Its very good for kids. Wash, remove skin, seeds and chop the chiku into small pieces. Reserve few for garnishing. In a mixer/juicer add all the ingredients and grind. 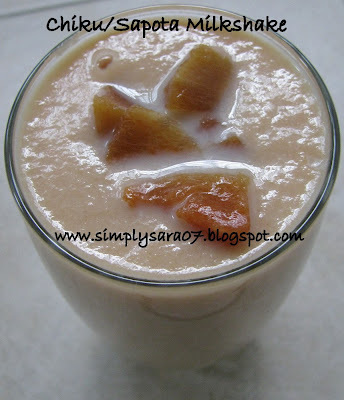 Chiku/Sapota Milkshake is ready to drink. Garnish with chopped chiku. You can serve them normal or chilled. This is off to Sanghi's FIL - Fruits. Other entries for the event are Apple Juice and Pineapple Kesari. 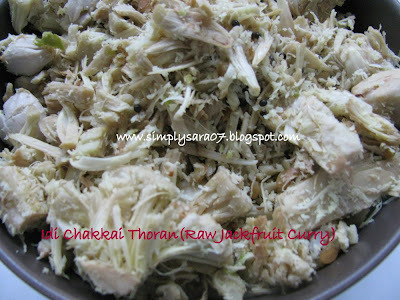 Idi Chakkai Thoran is very popular and speciality of Kerala, India. Its prepared with Raw Jackfruit and coconut oil. Its called Idi Chakkai since Idi is called mashing in Tamil and Malayalam and Chakkai is Raw Jackfruit thus came the name. This is usually prepared for marraige in Kerala. When we saw this in Little India just got it. 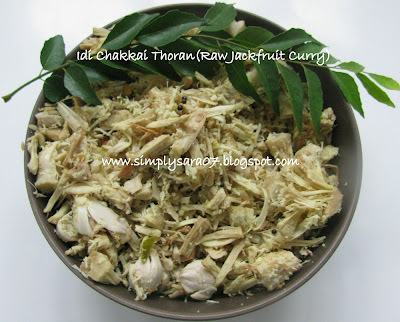 Remove skin of the raw jack fruit and cut into big chunks/pieces. You can cook in Kadai or Pressure cook it to 1 whistle with little water, turmeric and 1 tspn coconut oil. Grind grated coconut and green chilli in mixie to 1 to 2 whips. In a thick bottom kadai/wok put oil, mustard wait till it splutters. Now add the cooked raw jackfruit and mash it with potato masher into fine pieces. Add salt and coconut oil. Finally add grinded mixture of coconut and green chilli. Cook for sometime. Couple of extra spoons of coconut oil gives the thoran more flavour and aroma. Idi Chakkai Thoran is ready to serve and is a perfect sidedish for any sambar rice. 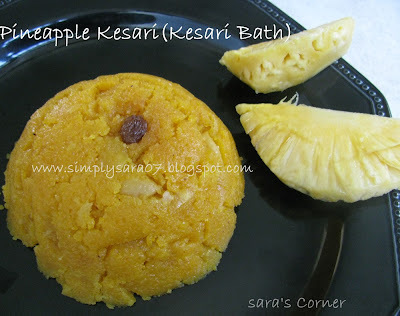 Kesari Bath is a famous sweet in South India. In Bangalore its one of fast moving breakfast with a combination of Upma or Karabath. I have had this in most of marraiges for breakfast in India. Its a sweet dish cooked with semolina(suji) and sugar. This recipe is in combination with pineapple. The taste is yummy. Cashews/Raisins - 2 tspns fried in ghee. Roast the rava with 1/2 tspn ghee till its little brown. In a thick bottom kadai/pan/wok keep hot water little less than that of making upma. Add pineapple, colour and 1 tspn ghee. Wait till pineapple is half cook. Once its done reduce flame, slowly add rava and mix well without allowing to form lumps. Once this is cooked add sugar and mix well. Add leftover ghee and mix well. Wait till no water is left. This can be served as it is or with Upma. Tip - When water is boiling add 1 tspn ghee so kesari won't stick on the bottom of the kadai. Life - The leftover can be had within 2 days even without storing in refridgerator. 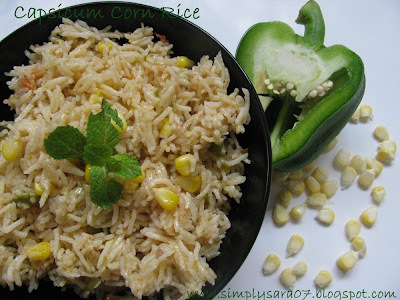 Capsicum Corn Rice sounds different but is a great combination. I tried first time with the instructions of my Father in law who is good cook. Thanks a lot. 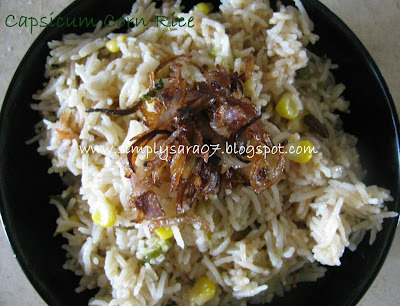 This is very delicious and simple rice. Its a non spicy rice. I usually prepare non-spicy food for my in laws. So this was a treat to them. We do not use garlic at home you guys must have seen it in optional. This is the first dish using garlic in my kitchen. Soak basmati rice in water for half n hour. In a pressure cooker, put 1 tspn oil deep fry little onion in brown colour. Keep aside. In the same cooker, now add ghee, oil, spices and saute. Add onion, ginger, garlic, a pinch of salt and saute till onion is transperant. Add tomato and cook till soft. 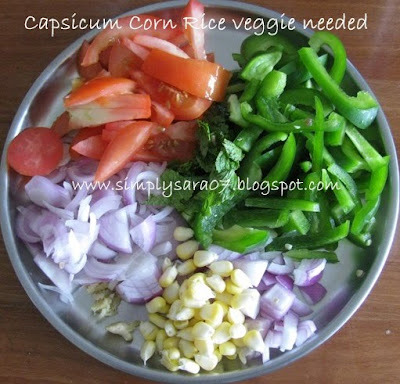 Add Capsicum and corn saute for few minutes. Add rice, coconut milk, water, mint leaves, salt and stir well. Garnish with the deep fried onion. Capsicum Corn Rice is ready to serve. Can be had as it is or with Raitha. 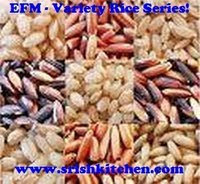 This Recipe is going for EFM Variety Rice by Srilekha. My other recipe going is Curd Rice with Pomagranate. Since I am unwell have extended my Oats Feast. But could not stop blogging. Potato chips are everyone's favourite. 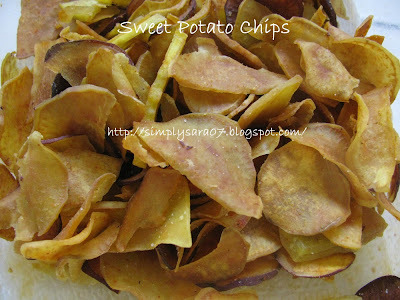 Sweet Potato Chips are very tasty and crunchy. It is very simple and easy to prepare. The texture of the sweet potato is different from normal potatoes. This is one of the recipes of my Mother in law who is a good cook and my hubby's fav. Thanks to her. Here you with the recipe. Wash, remove skin and slice the sweet potatoes into round thin pieces. Heat a kadai with oil. Once its hot. reduce flame to medium-low and drop the potatoes slowly. Once all are done sprinkle salt and chilli powder and mix well. Store it in a air tight container. 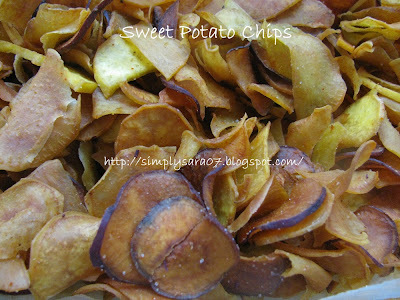 Homemade Sweet Potato Chips is ready to eat. This can be had as it is or for rasam rice. I am extending the Oats Feast Event till 31st Dec.
Do send in your entries for the event. 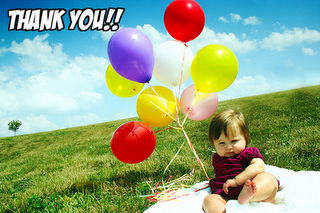 Thank you for your support and participation in my events. I am so excited that my blog has completed 3 years and but am celebrating it as my First Blog Anniversary. On the eve of Christmas and New Year am hosting an Event "Cakes n Cookies". Selected recipes will feature in my Facebook Sara's Corner Page before 30th Dec, so you can try any of the recipes. 1. Use the link in your post and use the Logo. 2. Post a recipe Dec 5th to Jan 30th. Bake a cake or cookies and send it. Eggless is preferred vegetarian friends can try but Eggs are allowed only to cakes. I have heard you can bake a cake without an oven thats pressure cooker method. If anyone tries you can send that too. 3. Email me at simplysara07@gmail.com with Subject Cakes n Cookies and following details. It gives me great pleasure to celebrate my blogs third anniversary but celebrating it as my 1st Blog anniversary since I missed first two. 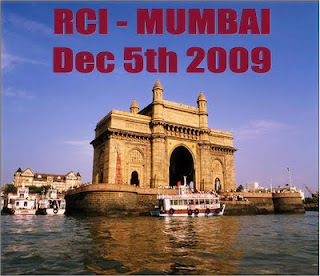 From last 1.5years I have been active in blogosphere. I started this blog just like that when I left abroad to record my recipes, just when I started learning cooking. The journey from Simply Sara(my blogs old name) to Sara's Corner has been a good learning and amazing experience. Now its become my daily routine were in have tried and learnt many recipes and I have made good friends. Am still learning. I would like to thank my family especially my parents and my dear hubby S....for their continous support, patience and encouragement. Not to forget my lovely friends out here for their comments which make me post more recipes. I have been hosting few events which went on well. My ongoing event is Oats Feast. Do send in your entries soon.